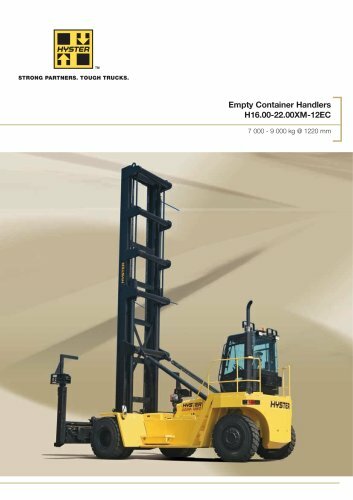 Hyster Empty Container Handlers H16.00-22.00XM-12EC container handler container handler container handler Increased All specifications and capacities are valid for trucks equipped with a Hyster empty container handling spreader for handling ISO containers. «Safety: This truck conforms to the Note: Specifications are affected by the condition of the vehicle and how it is equipped, as well as the nature and condition of the operating area. If these specifications are critical, the proposed application should be discussed with your dealer.